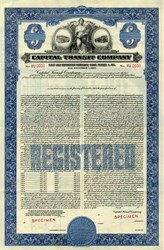 Beautifully engraved specimen certificate from Capital Transit Company printed in 1944. This historic document was printed by Columbian Bank Note Company and has an ornate border around it with a vignette of an allegorical women flanked by two buses. This item is over 62 years old. In December 1933, the Washington Railway and Electric Company merged with Capital Traction forming the Capital Transit Company. For the first time, all street railways in the Washington were under the same management. On 28 August 1937, the first PCC streetcar entered service in Washington on 14th Street. Over the next two years, all cars would be replaced by the PCC model. On 12 September 1949, Louis Wolfson purchased from North American 45.61% of the company's stock for $20 per share. The sale allowed North American to comply with the Public Utility Holding Company Act of 1935, which prevented North American from owning other businesses along with the Potomac Electric Power Company. This came about after a decision by the United States Supreme Court's in North American Company v. Security and Exchange Commission in 1946. The former powerplant on the Georgetown waterfrontIn 1956, in response to a carmen's strike, Congress and the District Commissioner revoked Capital Transit's franchise. The franchise was sold to O. Roy Chalk, a New York financier who owned controlling interest in Trans-Caribbean Airways. He purchased the assets of Capital Transit under the corporate title of DC Transit. Part of the agreement was that he would eliminate the streetcars and replace them with buses. The last streetcar ran on 27 January 1962. Most of the cars were sold to Barcelona and Sarajevo. Most of DC Transit's assets were purchased by the Washington Metropolitan Area Transit Authority (WMATA) in 1973.